This resort offers privacy and luxury. The perfect combination to enjoy your Caribbean Holiday!! 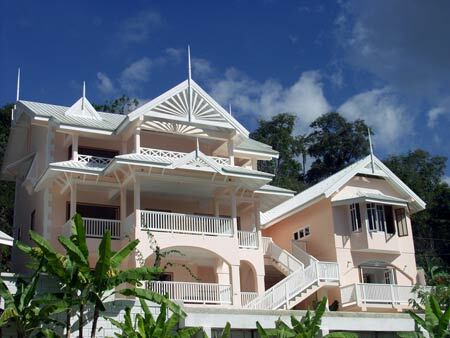 Hibiscus Villas is located minutes from the Mt. Irvine famous PGA Golf Course with a stunning view of Buccoo Reef. The resort is very versatile, it offers: The Main Villa, with 4 bedrooms, a small villa with 2 bedrooms, a pool side suite with 2 bedrooms and a studio apartment. Feel free to rent the entire resort, or just part of it. 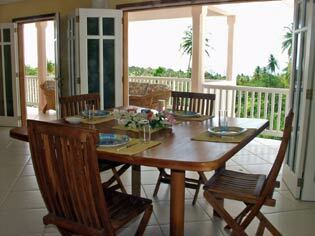 Hibiscus Villas can host comfortably up to 14 guests, making it ideal for groups and wedding parties. This property is surrounded by a well manicured tropical garden, with each accommodation enjoying views of Buccoo Reef and of the infinity pool. Mt. Irvine Beach is a drive of less than 5 minute away. 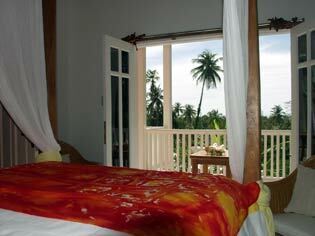 This villa offers 4 bedrooms all elegantly decorated with high quality handcrafted custom built wooden furniture. Tiled throughout giving that cool Mediterranean feel, each room is equipped with A/C, ceiling fan, and ensuite bathrooms along with a fully equipped kitchen for your comfort and convenience. The living room is equipped with cable TV, and stereo. 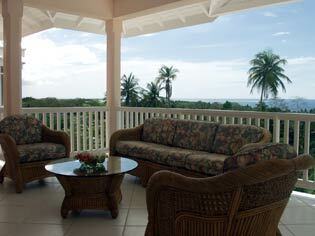 The covered balcony is for you to relax and enjoy the islands atmosphere and the spectacular views. 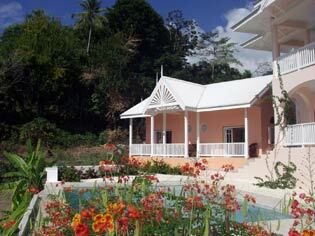 This two bedroom villa is a complete separate unit built beside the Main Villa, allowing for total privacy. 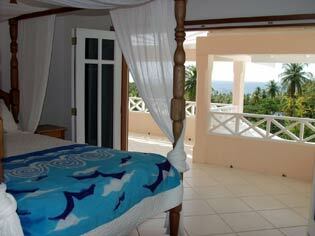 Each bedroom has ensuite bathrooms, A/C and ceiling fan. The master bedroom offers a king size bed while the other room a double bed. The kitchen, fully equipped. Both bedrooms have direct access to the fully furnished verandah where you can ‘lime’ and dine with your friends and family. This two bedroom apartment has a unique design. The two bedrooms share one bathroom which is built between the rooms with sliding doors on each side. Both rooms have doors opening onto the covered open-air living room overlooking the pool and garden where the kitchen is also located. Each room has A/C, ceiling fan and face basins. The master bedroom offers a king size bed while the second bedroom twin single beds or one double bed, according to your wishes. This is truly a unique apartment that allows you to enjoy to the fullest of out-door living, Caribbean style! This spacious fully self-contained studio apartment gives the ambiance of a villa, with a double bed, ensuite bathroom, bar-style kitchen, and ceiling fan. The main doors open onto a private verandah, furnished with table and chairs, with a view of the Caribbean Sea, overlooking the infinity pool and lush gardens.